Can we call it love song? The early risers among us may have noticed that songbirds are singing again. For Northern Cardinals and Carolina Wrens in our gardens spring has started with the change in day length on December 21. One can really notice now that the mornings get light earlier with every day and the males of our local songbird species are getting ready for the next breeding season. They set up territory and woo females. But more about our local birds on Friday, let’s travel to the tropics! In the tropics, birds barely take a break from singing. If conditions allow it, they will breed year-round and thus most of them keep their territory and mate. Such long-term relations call for special communications: males and females of many neo-tropical wrens sing very precisely coordinated duets. For the untrained listener it may sound like one song, that’s how closely the phrases are linked. Researchers, however, have shown that both male and female contribute to this continuous song, thus performing a duet. Can you hear whether these are two birds singing or one? Sandy Gaunt, curator emerita from the Borror lab and longtime volunteer, recorded these Stripe-breasted Wrens Cantorchilus thoracicus in the dense undergrowth of the tropical lowland wet forest in Costa Rica on no other day than February 14 in 1992. Sandy found these birds near the Hitoy Cerere Biological Reserve, southwest of Puerto Limon in Costa Rica, a rugged and undeveloped park with abundant wildlife. The song of a close relative to the Stripe-breasted Wren, the Plain Wren Cantorchilus modestus zeledoni, has been studied in some detail by Karla Rivera-Cáceres from the University of Miami, Florida. These wrens perform precisely coordinated duets as you can see for yourself in the spectrogram below – a visual representation of sound with frequency or perceived pitch over time. Both males and females adjust their song and pauses between songs to coordinate with their partner. 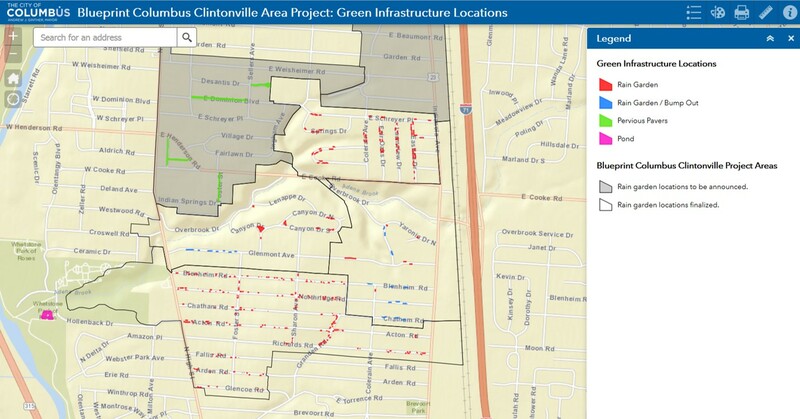 Red bars indicate the female’s contribution, bluish bars the male’s. Listen to these male and female Plain Wrens duetting as recorded by Jacob R. Saucier. The recording is archived with Xeno-canto, an online collection of bird songs from around the world (XC319021). Duet of male and female Plain Wren as recorded by Jacob R. Saucier (XC319021). So, shall we call this a love song? There are many hypotheses for why birds duet, one suggests that the level of coordination may signal pair bond strength, the level of commitment a mated male and female have of cooperating with one another. Other hypotheses suggest that duetting may help mates to stay in contact in dense habitat, or two singing birds may be more intimidating and thus more effective when defending a territory. Future research will show which of these hypothesis is most likely for the Stripe-breasted Wren. Rivera-Cáceres, K. D., Quirós-Guerrero, E., Araya-Salas, M., & Searcy, W. A. (2016, November). Neotropical wrens learn new duet rules as adults. In Proc. R. Soc. B (Vol. 283, No. 1843). The Royal Society. About the Author: Angelika Nelson is the curator of the Borror Laboratory of Bioacoustics and instructor for the OSU Ohio Birds class each spring. 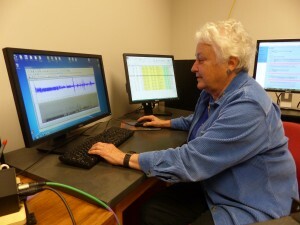 Sandy Gaunt was the curator of the Borror Laboratory of Bioacoustics until 2002 when she retired and decided to start volunteering in the lab. 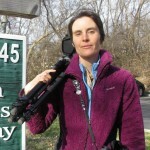 As an adjunct Assistant Professor of our department, Sandy did research on the syringeal structure in various bird species and has published her findings in numerous scientific journals. 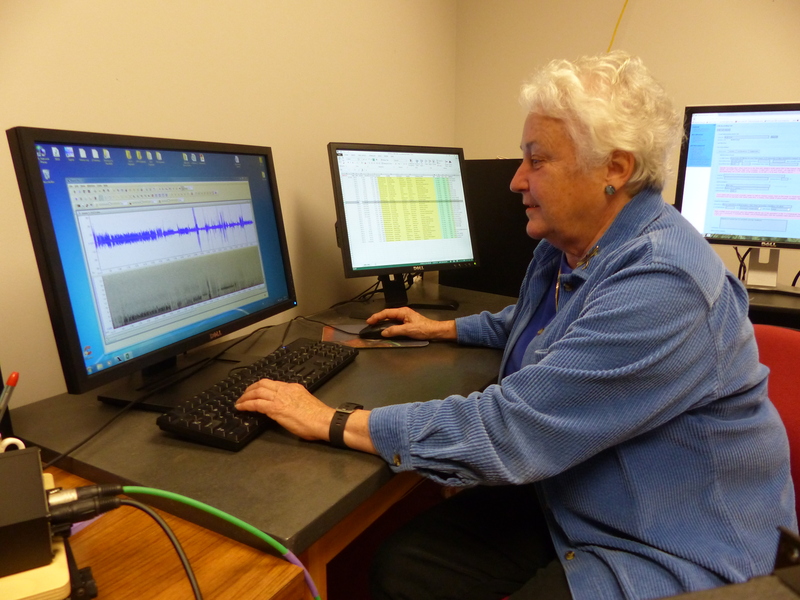 In her role as a volunteer digitizer in the lab, Sandy has digitized many recordings. She was pivotal in the NSF-funded digitization project of Don Borror’s over 14,000! recordings. Lately she has digitized recordings by Arthur Borror, Don’s son. Of this collection, Sandy has to date digitized 173 cuts of 113 bird species in three different countries, Belize, Canada and USA from Arthur Borror’s collection. Sandy does not only donate her time to our lab, she also makes a monetary donation each year to support student workers in the lab. We are extremely grateful for having Sandy in these capacities. Interview by Angelika Nelson, curator of the Borror Laboratory of Bioacoustics with Sandy Gaunt, long-time volunteer in the lab. It’s the time of year when ONE BIRD receives all the attention, at least here in the USA: the turkey. Turkeys have been part of the human food chain for a long time, Native Americans hunted them for food and so did the first settlers. Due to unregulated hunting turkeys declined dramatically with the increasing human population. By 1904 turkeys had all but disappeared from Ohio. 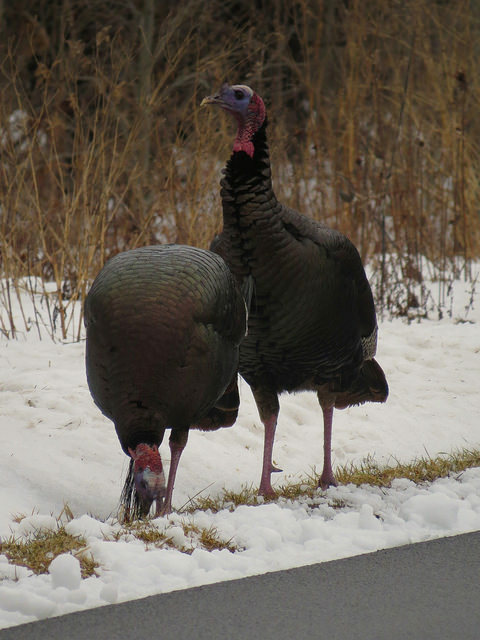 Today the Wild Turkey Meleagris gallopavo is again a common sight in many metro parks in Ohio. Blendon Woods, for example, has a good population that can be observed easily, often even at the feeders at the nature center. 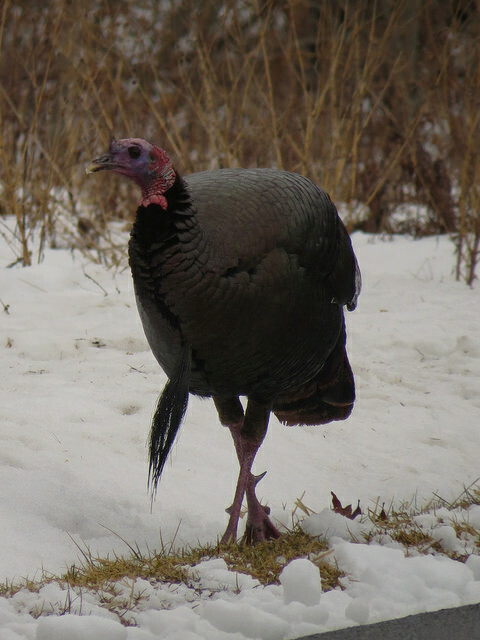 Male Wild Turkey at Blendon Woods metro park in March 2015 (photo by Alex Eberts). Note the bristly “beard” extending off the chest and the spur on the legs. 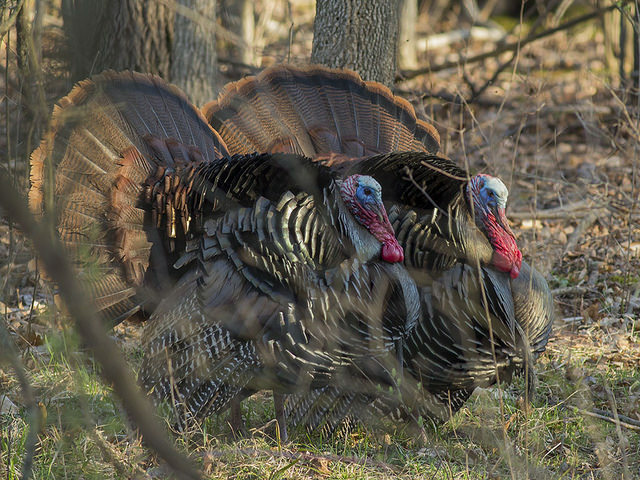 Note the bristly “beard” extending off the chest of male turkeys and the spurs on their legs as seen in the photos above. The two males on the right are displaying and probably make some “gobbling” sounds. 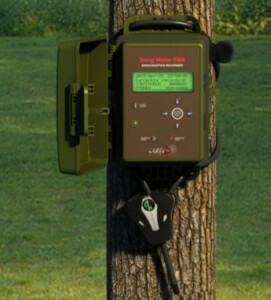 The gobble is a loud, rapid gurgling sound, it’s the turkey’s version of a rooster’s crow. I hope this made you appreciate the diversity of turkey calls and you will listen for their calls next time you visit one of the metro parks. All recordings are of captive birds at the Ohio Agricultural Research and Development Center, Wooster, Ohio in 1974. You can listen to the full recordings by clicking on the cut numbers above. About the Author: Angelika Nelson is curator of the Borror Laboratory of Bioacoustics.